← High River Prepares For The World. High River Alberta, That Is!! Things to do this week in London – 13 to 19 July. London, England that is!! Have you tried playing Shuffleboard? IN LONDON?? Try your hand at Shuffleboard at London Shuffle Club!! Board over bowling and over mini-golf? Time to try shuffleboard! 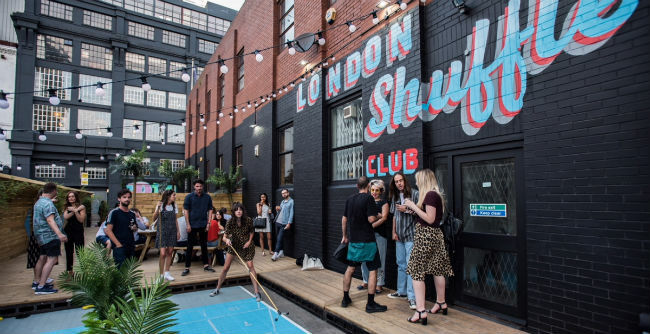 After a series of pop ups try outs, London Shuffle have now opened London’s first permanent floor-based shuffleboard club. Located in Shoreditch, you can play while snacking on pizzas, and guzzling beers and cocktails. Lanes are £20 per hour (off peak) and £40 (peak) and 2-8 people can play on a lane at a time – enjoy!